Planning and sketching has never been my strongsuit, although I always end up doing some sketches well into the process, especially if I am composing without notation, which is something I often want to do (using Logic Pro for instance). Part of the reason I am writing this post is to share my ideal planning phase, then hopefully actually implement it in my work process. Generally when I plan out a new piece I start with a high level concept (instrumentation/type of work), then I consider overall structure (single/multiple movements), form for each movement, then thematic/motivic ideas. This tends to be the fun part. The “hey I want to write an orchestral work” part. A lot of this phase is done in my head if I can resist just opening Sibelius or Logic Pro and loading instruments or setting up a score. Sometimes I toy with the idea of coming up with a title during this phase, but that has never been an easy task for me. I definitely went through the period of my life where everything was “Sonata” or “Quartet”. In addition to the more technical aspects of the work, this is where I consider the conceptual ideas or the inspiration for the piece. I tend to avoid directly programmatic pieces, but recently I have tried to create pieces inspired by ideas, fiction, or general mood. Through the Mystic Woods is a recent piece I composed with a bit of a “fantasy” vibe in mind, for instance. After conceptualizing the piece as a whole, I like to plan out the movement strucuture of the piece. Although I often write single movement pieces, I enjoy composing multi-movement works as well. My idea of a movement based work is often based on the classical 4-5 movment plan. I also like to interconnect these movements thematically, although that consideration is more likely to come up in the lower level planning phases or the actual composition phase. Sometimes, if it is supposed to be a big moment I will plan out the introduction of thematic material from one movement into another here. If I am composing a ballet, suite, or a concept album, this phase is where I will round out the overall structure of the concept. 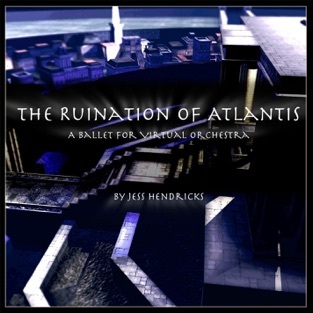 When I composed my ballet for virtual orchestra, The Ruination of Atlantis, I decided on the number of movements and their titles during this phase. This phase is obviously repeated for each movement, and is somewhat optional depending on the type of work I am composing. I have found that it is helpful to at least try to plan out the rough form of a movement as a check on myself, otherwise chaos reigns in my creative process. Through this process I have found that often the best forms are often variations of simple forms such as binary, ternary, or other similar forms. Coming up with motivic material is far and away the hardest phase for me. It can be helped significantly by completing the structure and form phases. Typically for me the themes for a movment will be the basis for all sections in a single movment, while those between movements may only be tangentially related. I will discuss how I come up with and develop thematic material in another post at a later date. Figuring out a way to inspire me to do this work led me to my latest pet project: a Composer’s Sketchbook application for macOS. This is another “bad” habit of mine… letting my composition time end up being gobbled up with programming or 3d art projects. Thankfully, I am getting close to having a usable piece of software that will help me accomplish everything I outlined in this post, including planning movements, form, and themes all in one place. It even uses the MIDI keyboard for note entry. Once it is in a workable state I will release it on the App Store, although because it is so specifically created with my personal process in mind I can’t imagine many composers rushing to download it. Each work can have multiple movements. Movement structure can be planned out by adding sections. Themes consist of an unmeasured motive that can be played back, displayed in different retrograde forms and inversions. In the end, I hope that this process will improve my ability to jump into a new composition and complete it more efficiently without banging my head against the figurative wall as much.